Recently, a very fabulous post by strength coach extraordinaire and founder, Girls Gone Strong, Molly Galbraith made the rounds over the internet. Molly made an excellent point which badly needs to reach out across the millions of people trying to change the way they look through exercise. Molly is an accomplished strength coach and articulates brilliantly why both women and men should stop fretting upon the way they look and end up using the wrong fitness modalities with an emphasis on only the 'Appearance'. Instead, a focus on performance and movement quality while choosing an exercise method or program can take us significantly further in our quest for a perfect body. Individually unique bodies can be taken to their own individual levels of perfection with training consistently. An important tangent though gets drawn here: eventually, there will be people all around us who will be quick in misusing Molly's advice into becoming extremely casual about their appearance and taking their physical condition and body composition to the very granted. In other words, these guys might take self-image acceptance to an altogether different level and forget that forming a positive self-imagery is only the first step of a series of uncomfortable changes which we may need in order to just keep getting better, it's not the end of it Developing a positive outlook towards whatever way we look like to start with is actually just a way to prevent us from going astray from our ultimate goal(no matter how long we take in reaching there) and trigger a series of other positive changes within our bodies such as making reasonable and sustainable food choices, developing an appetite for physical activity and fostering of an attitude bent towards traveling to newer places and meeting newer people. Using positive body image formation as an excuse to simply not do anything to change your current state of health is a surefire way to sabotage an intelligent perspective and bastardize a smart way of thinking into a self-destructive mindset only doomed for nowhere. Just be careful and try not to fall into the trap of fooling yourself into being unable to distinguish between self-acceptance and self-over-pampering. It's a rather easy trap to fall into and needs an eye of attention to distinguish. Acceptance of our current situation is the first step in becoming better and in the realms of physical transformation, this also necessarily includes stopping to curse ourselves and derogate the way we look. Now, what can possibly beat THAT? Positive explanations like these fill you with self-reaffirming imagery and thought process that is paramount to have before you get your new exercise suit on and get to the gym on your year long spree. This also tells us in a very logical manner that in terms of the way we look, all our bodies are unique. The individual skeletons which we all posses are all characteristic of our own selves and there is no sense in longing to change our natural biomechanics and joint-matrix to resemble someone else's. Usain Bolt has a charaterstic skeleton and muscle belly formation and fiber running length, which might be altogether different from Michael Phelps'. And they are both champions. Each of these guys were unique in their shapes: Different and perfect in their own right. 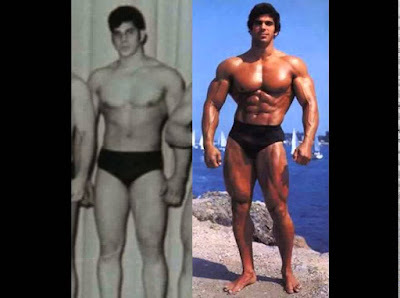 Most bodybuilding zealots may often come up with questions such as how to make the upper chest more developed in comparison to the lower aspect, or how to make the peak of the biceps appear higher or how to make the lower abs get more developed in comparison to the upper abs. Well the answer to all these curious questions lies in the understanding that any amount of training cannot completely alter the individual shape of someone's muscles' articulation and the way the muscle fibers run along lines and originate and insert at different points for different people. What training in fact can help people with is magnifying what nature has already bestowed them with. 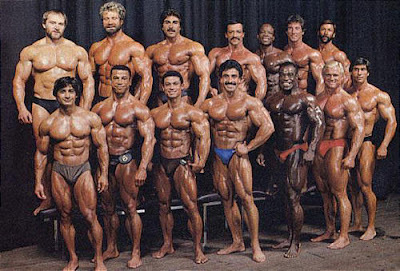 Hypertrophy or muscle surface area enlargement of a muscle fiber can have a unique trend differing from individual to individual. Because of the innervation and muscle attachment points, some of the folks might remain perpetual strugglers when it comes to calf development. While some of the guys having a relatively long neck might get enormous trapezius development and still feel they are not there yet. Same goes for people having longer limbs in general. 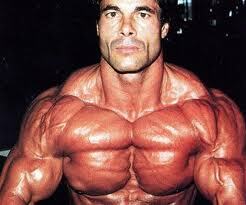 Lou Ferrigno: A result of targeting the complete muscle to grow and not selectively growing parts of it. b. Start practicing that movement for a given amount of training volume spread over a given block of time progressively increasing the difficulty of performing that movement. Those who did not catch the drift of what just came out of my keystrokes above, we are talking about progressive resistance training here. Practicing big basic heavy movements will eventually cause your involved muscle groups to get bigger. With this increasing size, eventually there will come a point when the adjoining bellies of the muscle groups will enlarge enough to convalesce into each other and the resulting ridge like formation creates the 'separation' effect. The phenomenon happens to cover the case of pectoral development really well where appearance of a line like ridge of separation is expected over the sternum region. This pectoral symmetry of Franco Columbu was caused by increasing the size of the entire muscle and not selectively training hoping to increase some portions of the muscle. Of course, a low body fat percentage is going to be paramount in the appearance of any detail which has developed for any muscle group. We have a large number of misplaced ideals when it comes to analyzing our bodies and most of it can be blamed upon the heavily Photoshopped and professionally photographed images of the cover models we look at on fitness magazines. Replacing our ideals to the right standards can create the positive base to start from which many of us might require. It's high time we reassess how we judge our own physiques. And as it turns out, it is way incorrect and away from how it is supposed to be. The first step of any physical or mental transformation is always going to remain the acceptance of the way we are and only working upon improving the state we are in to a better self.